Caftan Woman: A Proud Day! Stan and Ollie. The Boys. Part of the family. 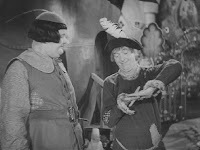 Here in Babes in Toyland aka March of the Wooden Soldiers from 1937 Stan brings back his famous finger wiggle which continually confounds Oliver. Janet (she of the alien-like long flute playing fingers) is a master at that finger wiggle. Henry Armetta in The Devil's Brother would be so jealous! 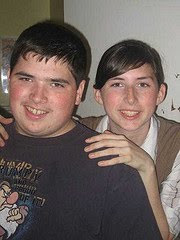 Younger brother Gavin faces many challenges with his diagnosis of autism/developmental delay. In his younger years when life would get him down, Janet would amaze and calm him with a display of the famous finger wiggle. It was practically guaranteed to cheer the lad. Dateline: Saturday, November 7, 2009 Gavin stood in the middle of the living room and placed his hands together. He stood in front of a mirror and - yes - he, Gavin himself, he performed the finger wiggle. Mommy cheered. Mommy hugged him too tight. Gavin blushed and grinned that grin that takes up his whole face. I rushed him to Janet. "Show Janet what you can do!" Again, the feat was greets with cheers and hugs, followed by more blushing and grinning. Has there ever been a more blog-worthy, classic movie related moment? Well, not in this family. I think it may well trump seeing Ernest Borgnine getting whooped by One-arm Macreedy on the big screen. Thanks, Ollie. Thank you, Stan. Way to go, Gavin. You're a champ. Thanks. It is quite a victory.